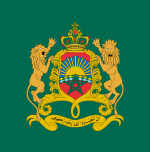 The flag of Morocco (Arabic: علم المغرب‎‎; Berber: Acenyal n Umerruk) is made of a red field with a black-bordered green pentagram representing the Seal of Solomon. Red has considerable historic significance in Morocco, proclaiming the descent of the royal Alaouite family from the Islamic prophet Muhammad via Fatimah, the wife of Ali, the fourth Muslim Caliph. Red is also the color that was used by the sharifs of Mecca and the imams of Yemen. From the 17th century on, when Morocco was ruled by the Alaouite dynasty, the flags of the country were plain red. 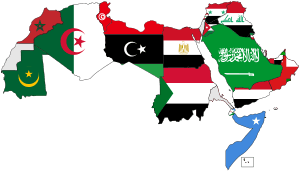 In 1915, during the reign of Mulay Yusef, the green interlaced pentangle was added to the national flag. 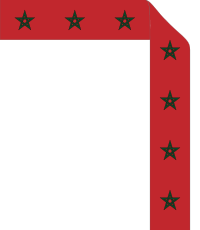 While Morocco was under French and Spanish control, the red flag with the seal in the center remained in use, but only inland. Its use at sea was prohibited. When independence was restored in 1955, it once again became the national flag. The red background on the Moroccan flag represents hardiness, bravery, strength and valour, while the green represents love, joy, and hope, it also represents the color of Islam, whereas the five-pointed star represents the seal of Solomon. To be known from this book, may God uphold its value and to be around the centre of grace and joy its orbit, that due to the promotion of our Cherifian kingdom affairs, the spread of its glory and its pride, the need to assign a flag that distinct it from the rest of the kingdoms as that our sacred ancestors flag use to be very similar to some other flags especially the ones used in the marine signs, our noble vision decided to distinct our joyful flag by making the five pointed seal of Solomon in the middle in green, asking the almighty god to keep it waving with the winds of fortune and ambition for this time and the becoming, Amen and peace. In accordance with the seventh article of the constitution, the emblem of the Kingdom shall be a red flag with a five-pointed green star in the center. The flag shall be made with fabric of canna red, opaque and rectangular in shape. The star shall be open, green like the leaf of palm trees, made of five continuous branches and woven in the same fabric where it must be visible on both sides of the flag. One of its points must point upwards. The hoist of the flag equals two thirds ( 2⁄3) of its fly. The star is inscribed in an invisible circle whose radius equals one sixth ( 1⁄6) of the fly's length and whose centre is the intersection point of the invisible diagonal lines of the flag's rectangular. The width of each one of the branches of the star shall be 1⁄20 of its length. On May 8, 2010, a Moroccan flag with a size of 60,409.78 square metres (650,245.5 sq ft), weighing 20 tonnes (22 short tons), was set in Dakhla, a city in the disputed territory of Western Sahara. It was certified by the Guinness Book of World Records as the largest flag ever draped. ↑ "Flag of Morocco". Famouswonders.com. 1915-11-17. Retrieved 2016-07-03. ↑ "Moroccan Flag". M.vexillologymatters.org. Retrieved 2016-07-03. ↑ "Archived copy". Archived from the original on July 19, 2011. Retrieved July 24, 2010.